I accidently discovered my April workshop walking out of the studio after my training session on Monday. I had previously seen the white board labeled Aerial Yoga-SOLD OUT but then forgot all about it. This past Monday, the board showed that they added a second workshop with just a few spots left. I immediately checked my schedule and signed myself up before I had time to think twice. Aeriel yoga?! Doesn’t that just sound like fun! I’ve never done anything like this, but had read an article or two about aerial yoga in a yoga magazine. I thought it sounded like fun, but had no idea what to expect. I have to say…the anticipation and surprise made the entire experience more exciting! We started with some brief introductions and then got right into our ‘silk’. In my mind, I saw us using the silk to support our hands or feet, but never imagined that we would climb in. But climb right in we did. And…I LOVED it! We started inside our silk in a cross legged position hands at heart center. There was a beautiful beginning meditation and then we did some stretching in this space. Afterwards, we moved through a vinyasa with the assistance of the silk. It was there to support us, challenge us, assist in flexibility, and provide a totally different sensory experience. It was a great core workout without feeling like a workout, but I was sweating! Then we moved on to inversions. As an ex-gymnast, this had to be my favorite part. Through the poses, we worked on loosening some of my tightest hip and back muscles. It was when I was floating upside down, smiling at myself in the mirror, that I realized that I could probably reach my phone. I don’t typically bring it into the studio with me, but wanted to capture this adventure on film if I could. I grabbed my phone and snapped a picture in the mirror. One of the instructors was also walking around and taking our pictures, so I’m hoping to get my hands on those too. I should pause and tell you that the two instructors are multi skilled yogi’s who were kind, approachable, and made everything seem achievable and fun. The toughest part of taking upside down photos was trying not to spin. I did end up with a few photos of the ceiling in the process. 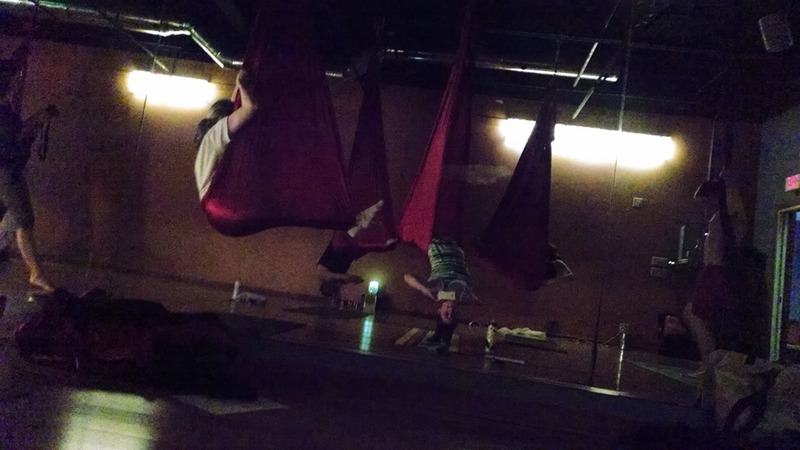 In the end, we cozied back into our silks for shavasana, which was absolutely incredible. I can tell you that it was tougher to calm and focus after all of my floating and flying, but the cocoon was so peaceful. 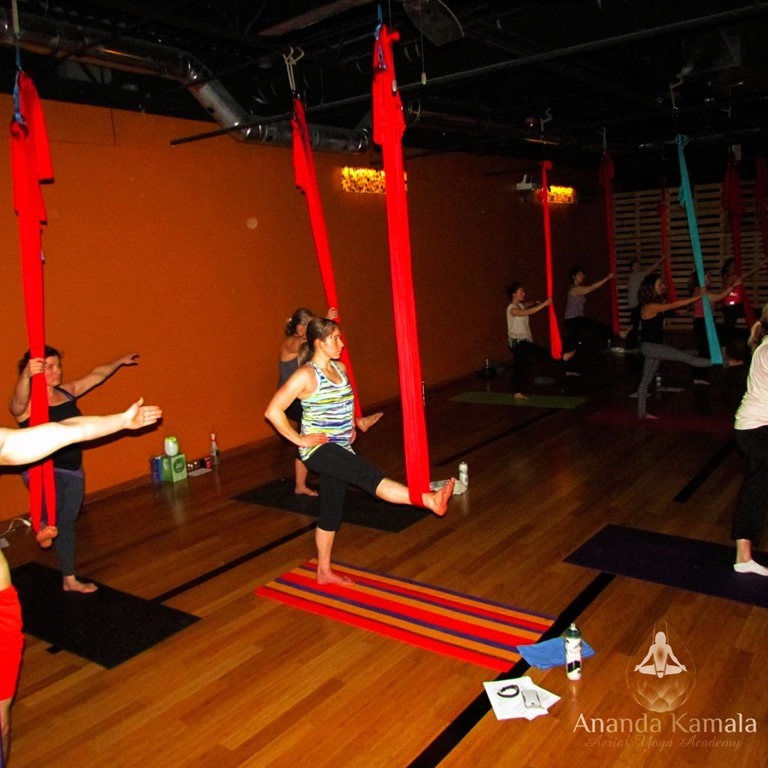 I found myself wondering how to create an aerial yoga set up in my house (or at least trying to figure out when I could attend another class). I think it would be amazing to do this more consistently, strengthening your body and working through some more challenging poses. It was an awesome way to spend my Saturday night! Having only 11 people allowed each of us to get hands on experience, but I will tell you that we needed a lot less support than I would have thought. I think this is a huge reflection on the talented instructors. I’m sad that the photos were dark, but so fun that they turned out enough for me to share my experience. I will have to post the professional ones if I can find them on Facebook. *Note…thank you to Ananda Kamala for the amazing pics! Each of these yoga experiences has deepened my yoga practice and allowed me to explore more of my emotional and physical space. I don’t have anything on the calendar yet for May so if you know of a local workshop or have suggestions, let me know. And just wait until you see what I am doing in June! 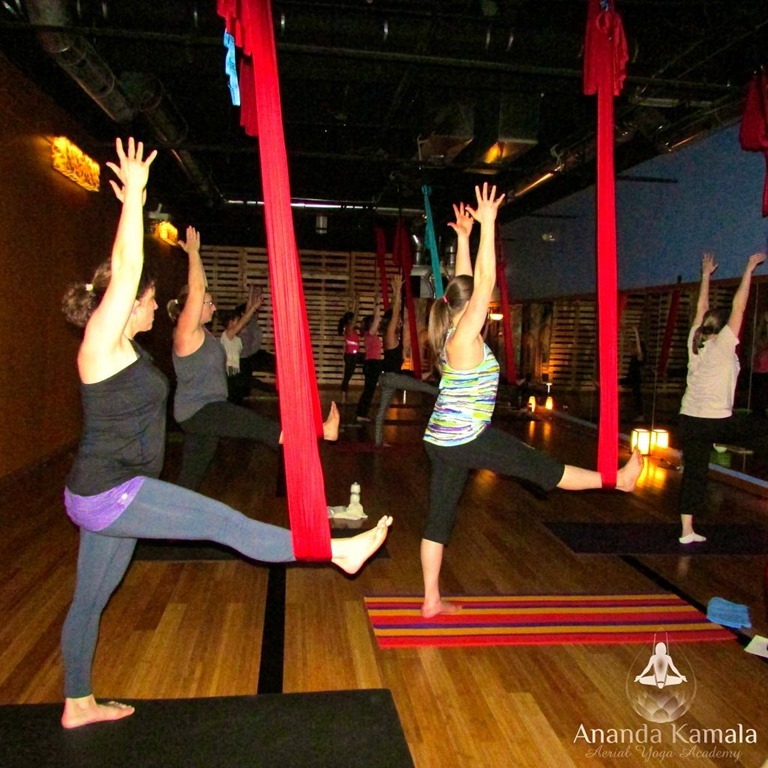 Have you ever tried aerial yoga? Do you want to? I would love to try this it sounds amazing and although I love yoga I am lazy about reading up on it. I have never heard of this and from your article I would be willing to replace my couch for this setup!!! Me too! What a fabulous idea! It is so interesting to learn about all of the different styles of yoga and fun new things to try! SO much fun!!! And I love that the inversions helped your tight back and hip muscles! I would love to try aerial yoga. Me too! You should totally give it a try. It’s awesome and really fun! The relaxation in the silk is unreal! They are the BEST! I hope you get a chance to try it! If I ever have the chance to try it… I will definitely take the opportunity! Looks very interesting!!! I think it is so neat that you are trying all these different types of yogas! So crazy to hear about them!! Thanks Leslie! This one is really cool and I loved the sensory experience! I’m so happy that you guys like hearing about them! This looks AMAZING! Totally gonna see if I can find some aerial yoga in MSP! I’m with ya… yoga has helped me so much 🙂 Excited to see what your next workshop is! That looks like so much fun! I don’t think we any of those classes around here. I could definitely use more yoga in my life. I think we all can! I know that I miss it when I don’t get there during the week!